This is the story about Kya who lives in the Marsh in North Carolina in the 1950s. She is the youngest child in her family - a family that is extremely poor and undereducated. Her dad is a drunk who often beats his wife and kids barely bringing home any money to support him. 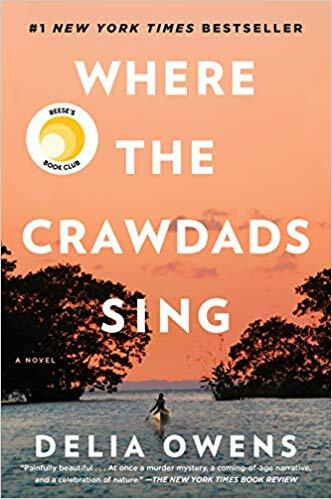 One by one, Kya watches her family leave the marsh and not return - starting with her mother, then her eldest siblings, and finally, her brother Jodie who is the closest to her in age. At the age of 6 she is left alone with her father who sometimes comes home/sometimes doesn't. Kaya starts to figure out how to take care of herself - feed herself and learn to live off the land. She only ever attends school for one day, chosing instead to stay hidden in the marsh. The book jumps back and forth between the 1950s and 1969 where a young man named Chase Andrews has died. The police suspect foul play - looks like he was pushed off a fire tower near the marsh. The book follows the life of Kaya and the time from when she was little up until the murder of Chase - weaving the story of how she learned to live off the land, meeting Chase and meeting a boy named Tate, and how she tries to discover love and how it fits into her life of lonliness. Someone recommended this book and so I gave into the hype and read it. It was an okay book. I didn't love it as much as I was hopping to. The writing was pretty good, but not as great as the reviews made it sound. I agree with many of the 3 star reviews on Amazon that the characters just fell flat. The story jumped all over the place, and sometimes I felt that there were gaps that shouldn't be there. It was a love triangle that didn't hold a lot of weight (or make a whole lot of sense), and almost a fantastical story line that is hard to believe. I don't want to NOT recommend this book - I may be judging it too harshly. I think overall it was good. I read it quickly - wanting to see where the story was going - not wanting to quit until I had some answers. But I was never in love with the book.